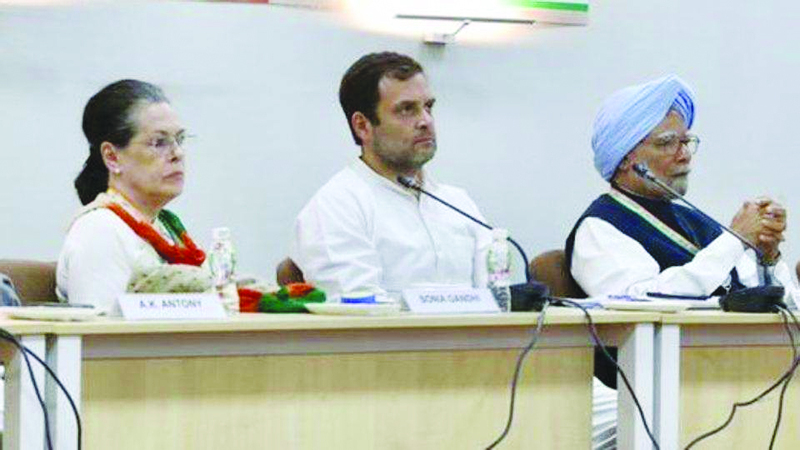 The Congress Working Committee held its meeting in Gujarat for the first time since 1961. (Insider Bureau)- Congress president Rahul Gandhi on Tuesday set his party's tone for the Lok Sabha elections at the Congress Working Committee meeting in Gujarat's Ahmedabad. Gandhi hit out at the Rashtriya Swayamsevak Sangh and the Bharatiya Janata Party saying they follow the ideology of "fascism, hatred, anger and divisiveness." Gandhi said the CWC has resolved the defeat the RSS/BJP ideology. "No sacrifice is too great in this endeavour; no effort too little; this battle will be won," Gandhi wrote on Twitter following the Congress strategy meet. The Congress president's comment comes amid talks for alliance with other opposition parties in Uttar Pradesh and Delhi. The Samajwadi Party and the Bahujan Samaj Party are contesting the Lok Sabha polls together in Uttar Pradesh. The Rashtriya Lok Dal (RLD) is also part of the grand-alliance. There have been talks over accommodating the Congress in the alliance to keep the anti-BJP vote in Uttar Pradesh intact. Similarly, the Aam Aadmi Party has been calling for an alliance with the Congress in Delhi, which has seven parliamentary seats. The Delhi Congress leadership is not in favour of having a tie with the AAP. The Delhi unit has rejected Delhi Chief Minister Arvind Kejriwal's call for an alliance. However, the AAP has kept its options open for fighting the Lok Sabha elections with the Congress to challenge the BJP, which had won all the parliamentary seats in 2014 in Delhi. At the Congress strategy meet in Gujarat, former Prime Minister Manmohan Singh said the party should highlight the achievements of the UPA government that was in power at the Centre from 2004 to 2014. UPA chairperson Sonia Gandhi targeted Prime Minister Narendra Modi saying he plays victim card but the people of this country are the real victims of his policies. She stressed that the Congress should move forward with a new vision. The Congress has been trying to corner the Modi government over a range of issues including demonetisation, rollout of the goods and services tax (GST), Rafale deal, agrarian distress and unemployment. 'Idea of India Under Attack': CWC Addressing a press conference after the CWC meeting, Congress leader Anand Sharma said the party adopted a political resolution expressing concern over attempts by the ruling party to "challenge" the values enshrined in the Constitution. Sharma said, "The Congress believes that the values enshrined in the Constitution and the rights given to people are under constant onslaught under the present government." "The idea of India, envisaged by Mahatma Gandhi, Jawaharlal Nehru…is being challenged in a way to replace the values that are against the principles espoused by the makers of the Constitution," he said targeting the BJP. The CWC resolution, Sharma said, condemned the attempts to take political mileage by the ruling BJP out of recent strike by the Indian Air Force on a terror camp in Pakistan's Balakot in the aftermath of Pulwama terror attack. "Entire blame goes to Prime Minister Narendra Modi and the BJP," Sharma told a press conference in Ahmedabad. "The Prime Minister is playing with the emotions of the people only to take mileage in the elections. We condemn it," said the Congress leader briefing about the CWC meet in Gujarat. Congress's Counter to BJP The CWC was held at the Sardar Patel Memorial in Ahmedabad. The choice of venue was being seen as a Congress's bid to counter the Bharatiya Janata Party's repeated allegation that the main opposition party has undermined the political legacy of the former deputy prime minister. The Congress strategy meet that began this morning was the first meeting of the highest decision making body of the party to be hosted in Gujarat in almost six decades. The last CWC meeting was held in Gujarat in 1961. This was also the first CWC meeting to be attended by Priyanka Gandhi Vadra, who took a political plunge in January. Priyanka Gandhi was appointed Congress general secretary in-charge of Uttar Pradesh East in the view of upcoming Lok Sabha elections. She is considered key to party's success in Uttar Pradesh, which sends the maximum number of members (80) to the Lok Sabha. The Congress meeting in Gujarat also marks the launch of historic Dandi March by Mahatma Gandhi. It was on March 12 in 1930 that Mahatma Gandhi began his march from his Sabarmati Ashram to protest tax on salt levied by the British colonial government. The CWC meeting was originally planned for February 28 but it was put off in the wake of heightened tension between India and Pakistan following violation of Indian airspace by the Pakistan Air Force on February 27. Earlier on February 26, the Indian Air Force had carried out a strike at a Jaish-e-Mohammed terror camp in Pakistan's Balakot in the aftermath of Pulwama terror attack, in which 40 CRPF jawans were killed. The Jaish-e-Mohammed took responsibility for the February 14 terror attack in Jammu and Kashmir.